With the OMS you can mark which properties are on show to increase the exposure they will receive - perfect timing for the weekend ahead! The properties you have marked as on show will appear in MyProperty’s On Show section, your own Flex responsive website, and selected partner property portals. When we say it is easy we really mean it! 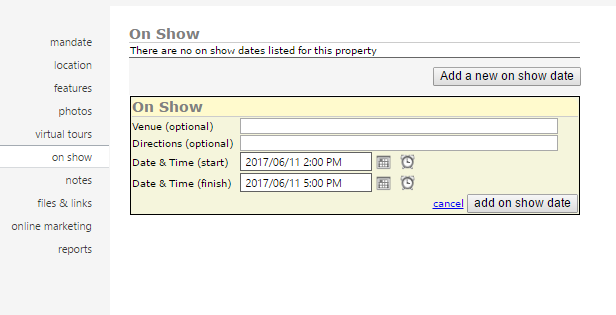 All you have to do is open the listing from the OMS dashboard, mark it as On Show and capture the on show details. That is all there is to it! If you make map location & address available in the OMS property location screen like this…. The OMS online real estate system allows estate agents to upload an unlimited number of virtual tours per property listing. Here we show how you can upload 360 panorama photos you've created to a property listing, and how it displays in the viewer. The 360 tour link is then added to your listing on your Flex responsive real estate website. To create the 360 spherical photos, you can use a specific 360 camera or try out a number of phone apps available, including the free Google Streetview app that can be used to create photo spheres. There are no additional hosting fees for our self service virtual tour solution, and you can create as many tours as you want. The OMS have been accepting the capturing of agent PrivySeal information for a while now, which is displayed on your Flex powered real estate website, as well as MyProperty. Now, these details are also displayed on your Private Property profile. To add PrivySeal to your profile first get your PrivySeal link, e.g. : https://www.privyseal.com/za/john-doe/eaab-estate-agent/1c.Go to your OMS profile.Select PrivySeal from your online profiles, and paste the link in. Now click on 'update'. Your username will be extracted. You can test your PrivySeal link by clicking on the 'test' link. If all is OK press save. With this new update OMS and Sync clients will be able to send the first 30 listing photos as well as their PrivySeal details to Private Property. The OMS supports residential, agricultural and commercial property capturing.